If you were a pastry cook what else would you be doing but restoring cars for a living? Mark Stevens, the proprietor of Slowys Speed Shop located at Capalaba east of Brisbane, Queensland did start out as a pastry cook, but like anyone, found that finishing his day’s work at 8am wasn’t exactly to his liking. Finishing at 8am might sound wonderful as you have the whole day in front of you, but it also meant that Mark started work as the previous day was reaching its end. Despite his night owl hours Mark did find that he could pursue his hobby of old cars during the daylight hours. This he did with some enthusiasm and to the extent that he was gaining quite a positive reputation from friends who would of course turn up during the day with a job or two that needed doing. Mark reckons that for a number of years he was surviving on just 3 hours sleep a day. Hardly enough for a growing lad. Like many classic car gurus, Mark’s hobby over 23 years turned into a career and with so many inhospitable hours behind him he decided it was time for a change. It was seven years ago when Mark swapped the mud cakes, Neenish tarts and chocolate éclairs for Chevs, Pontiacs and Fords by setting up Slowys Speed Shop. If you’re wondering where the name came from, it’s from Mark’s formative years when many a misspent hour was devoted to pinball machines. Slowys Speed Shop not only allows Mark reasonable working hours, but also to provide a restoration service to his customers dictated by a standard and not a price. Within the shop Mark says that he can fit up to six cars at any time, but it’s more comfortable with five. Mark Stevens just loves motor cars and working by himself, which means that Slowys Speed Shop is a one-man operation where, with the exception of machining and upholstery work, everything is done in-house. In the lead-up to any restoration Mark likes to work closely with his customers so that he is fully aware of their wishes and of course vice-versa. Mark is prepared to undertake any project as long as the customer is also prepared to have the work done properly. He is proud of his reputation and wants his customers to be justifiably proud of the results. 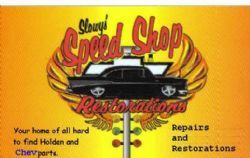 Slowys Speed Shop is a one-stop restoration business where the vehicle is dismantled, old finishes stripped, etched primed where necessary, repaired on a rotisserie, modified if required and reconstructed. Mark undertakes all mechanical rebuilding himself including engines, gearboxes, differentials, brakes and so on. All re-finishing is also done on-site. Mark says that by doing everything himself is the only way he can guarantee a 100% perfect result. Mark also finds that many customers come to him for advice when they haven’t been happy with the work of another restorer. He says that it’s unfortunate that he spends so much of his time rectifying the mistakes of others. When we spoke to him he had just finished ensuring a much cherished EH Holden was roadworthy. This included fabricating the hand brake mechanism, rebuilding the front-end so that it could be correctly aligned and securely attaching the steering to the frame of the car. 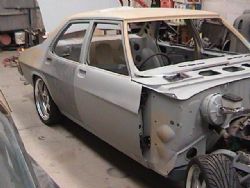 Other cars of interest receiving Mark’s tender care are a HZ Holden that has received a full body-off restoration and modifications to accept a 350 Chev engine and Aussie M-21 4-speed. Interestingly the owner also wanted the HZ to be trimmed as it left the factory and Mark was successful in finding a complete set of interior trim in Melbourne. Of course, after such a restoration an engineer’s certification is required, which Mark is happy to organise. 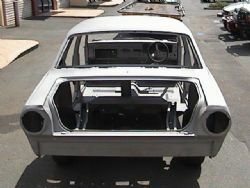 Currently on the rotisserie is an XT Falcon that previously has its chassis rails replaced with incorrect section steel. Mark has since rectified the errors and when finished it will be fitted with a later engine and auto transmission. Also under restoration is a 1957 Chev sedan that beforehand most would have shaken their heads and taken it to the tip. Mark describes the work more as a resurrection, than a restoration. While some components were restorable Mark has also remade sections of the chassis, inner guards, body panels and while all this is going on the body is being altered to a 2-door. 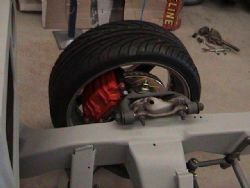 When finished it will be fitted with a small-block Chev engine and Turbo 400 transmission. Depending on the work on hand Mark estimates that it takes around 12 to 18 months from when a car arrives to when its proud owner can drive it on the road. Although he does say that there have been quiet times when a car has been in and out within 6 months. If you’re out and about in the Capalaba area it might pay to give Mark a call on (07) 3823 2554 and arrange a visit to Slowys Speed Shop.